The Russian government has announced that it is seeking to source equipment for offshore oil production from new countries due to the impact of sanctions by the European Union and the United States. However, as experts note, the development of Arctic fields is being hindered by low oil prices. Russia’s Deputy Prime Minister Alexander Khloponin has admitted that Moscow was too slow to find alternative supplies of equipment for offshore oil production and needs cooperation with other countries that have experience in this area, the Interfax news agency has reported. Due to the sanctions imposed to punish Moscow for its role in the Ukraine conflict, Russia's traditional partners – the U.S. and European companies – are prohibited from providing services to exploration and production on the Russian shelf at a depth of over 150 meters. However, Khloponin said on Sept. 22, there are many countries with experience in offshore drilling that have not imposed sanctions on Russia. According to the forecast of the Ministry of Energy, by 2035, Russia will produce a total of 50 million tons of oil on the shelf, i.e. 9.5 percent of total production. "The development of offshore fields has been stalled not only by sanctions, but also by a sharp drop in oil prices. With the current state of the energy market, expensive development in the Arctic is simply unprofitable," said Ilya Buturlin, managing director of trust management company Hedge.pro. The problem of carrying out the so-called “import substitution” of equipment for offshore drilling emerged in 2014, when the U.S. and the EU banned imports of technology for use in Russian Arctic projects. 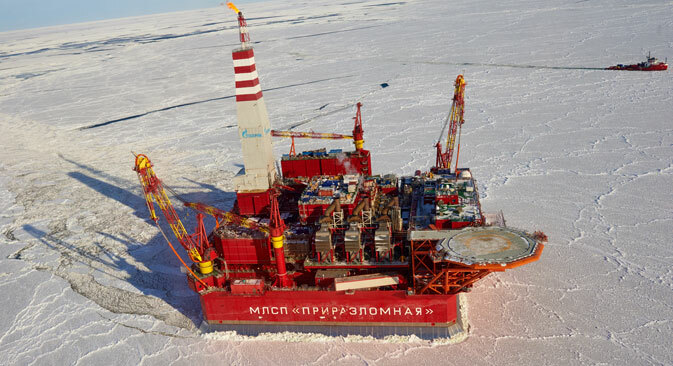 By that time, Russia's largest oil company Rosneft and the American ExxonMobil had discovered the Pobeda oil field in the Kara Sea and drilled a well, but after the introduction of sanctions foreign partners had to suspend their participation in the project. "Offshore drilling equipment has been never produced or even designed in Russia," says Freedom Finance Investment Company's head of operations in the Russian stock market Georgy Vashchenko. "For its production and use to be economically viable compared to imports, it must be produced in large quantities, including for deliveries abroad." According to Vashchenko, only three customers can provide the demand for the equipment in Russia at the moment – Rosneft, the gas monopoly Gazprom and the private company Lukoil, which produces oil on the shelf of the Caspian Sea. According to Pyotr Dashkevich, an analyst with investment company UFS, the actual impact of sanctions on the development of offshore fields is not as significant as the effect of the fall in oil prices. "Many of the projects announced were attractive due to high energy prices," he said. At the same time, according to Dashkevich, contracts with Western partners had been signed before sanctions were imposed and, accordingly, do not fall under the restrictions, but almost all of these projects have been delayed or abandoned. At the beginning of 2015, the Ministry of Industry drafted a plan for import substitution in the oil and gas industry, but according even to this document, it is planned to reduce the share of imported equipment for offshore projects to 60-70 percent only by 2020. "Before the introduction of sanctions, Russian companies had cooperated with the American, Norwegian and Italian suppliers, but now China and South Korea are also being named among the potential partners," said Ilya Buturlin. Moreover, according to him, companies such as General Electric are now ready for the localization of individual equipment for Russian offshore drilling vessels. However, according to Dashkevich, it is companies from Europe and the U.S. that are most interesting for borrowing the technologies, as they have the experience of working on the shelf and specifically in the Arctic, while Asian companies are likely to have had only “local experience,” though they may “be interested in supplying equipment and providing subsequent maintenance."